Crazy. Really? It was in the South of France in late spring 1999 when I talked to my wife Sibyl about the vacation we had planned for October and which my company was unable to grant because of lack of pilots. It was not exactly the first time this had happened. Sibyl then asked me whether I had another one of my projects up in my sleeve. Of course she knew me and when I replied I could fly around the world with my Long-Ez in early 2000 she suggested to take the reminder of my allotment of vacation for the year 1999 in March and some of my year 2000 allowance in April 2000, I knew she would be part of the flight. But then came the real test. I just said "twice". She didn't declare me insane right on the spot although she probably was close to it. 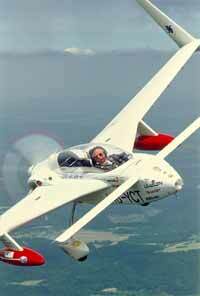 Jon Johanson of Australia who circumnavigated the World with his RV-6 in two different years holds the current World records for "Speed around the World Eastbound" and "Speed around the World Westbound". I was convinced with good planning and the right aircraft it should be possible to break these records. At the time I hadn't made any calculations, but I knew my aircraft was almost ready. I had flown from Zurich / Switzerland to Cape Town / South Africa in 1997 to commemorate 70 years of Walter Mittelholzer's flight with a floatplane to South Africa. In 1998 I flew a memorial flight to and all around South America to honour those French heroes of the legendary Aéropostale who opened up the air routes from Toulouse / France to Santiago de Chile. Both flights were a big success in the local as well as in the international media. There were just minor additions I would have to make to have my Long-Ez ready to try to break those records. I had started to build my Long-Ez in 1984 together with a colleague who had joined me. After four years and 4000 hours the aircraft was completed and in May 1988 made its maiden flight. Soon I was the sole proprietor of the canard, as the partnership didn't work. In the coming years I systematically transformed the plane into a long range travelling machine. Of course this was less than easy, as the Swiss authorities gave me at first a very hard time when I suggested to add auxiliary tanks to the rear seat to break some records. I was finally able to convince them I really meant it. It took a lot of effort, money and nerves but finally I had the official papers to operate the aircraft at the necessary overweight. In time I added a short wave radio (difficult antenna problems in a composite pusher), a new engine (Lycoming O-320 with 160 hp), a new LASAR electronic ignition system (the Swiss authorities absolutely declined to approve anything which was not FAA approved), a new propeller (Muhlbauer three blade variable pitch), three different GPS (KLN-90B, Garmin 195, Skyforce Skymap), an EPIRB ELT and many other small refinements to make the aircraft capable to fly very long distances. All this additions made the aircraft heavier and the space available smaller but each and every refinement I had built in finally proved its worth. From experience I knew it would be hard work to find the necessary funds and to plan the flights in the short time till the end of February 2000. I asked my company for eight weeks of vacation in March / April 2000, the absolute minimum time I had calculated to accomplish the double circumnavigation. The request was posted by end of June but it was extremely difficult to convince my superiors to grant the requested free time, also I could guarantee them worldwide media exposure as I had on my two flights before. It took much too long until I had my approval and so I could only start to plan and to seek sponsors by early October 1999. The task to find enough companies to at least cover the direct costs of the flight and to plan the circuits, to get over flight permissions and visas, to contact fuel companies to deliver fuel to remote islands was almost Herculean. I had said time and again I would take "no" as an answer with no bad feelings, but I also made absolutely clear that I needed a decision, and fast. Unfortunately the lack of pilots seemed to be so severe I only got an answer almost three and a half month after my first request. I sent out dozens upon dozens of my brochures (18 pages, available in German, English and French), called executives and tried to sell my project as well as I could. The results were mixed. Some companies replied I was too late as it was already October but that I could come back with a project for the year 2001, others (most) were just not interested in aviation or didn't believe I could do it. One executive asked me first "What if you should have an accident?" forgetting his company had operated aircraft, which last winter were not stopped flying when we had 60 knots winds in Switzerland with gusts way above that, causing widespread damage… Others had promised they would help but when I approached them personally they suddenly were incommunicado. Promises. I had lots of them and very few materialized. On the other hand the companies finally helping were dedicated and especially SAirGroup (the parent company of Swissair) and Unison Industries (LASAR electronic ignition systems) did much more than could have been expected. Planning the flight was quite demanding as well. I tried to enter as much professional knowledge (normally I fly the MD-11 as a captain on Swissair's worldwide network) and past experience of my former flights into the planning as I could. The more unknowns I could eliminate, the more facts I could generate, the fewer problems I would have on my way. Of course I knew I still had more than enough unknowns and risks to tackle, which were impossible to confront beforehand. But it was extremely important for me to do as much as I could in the extremely short timeframe I had. I wanted to bring the two World records to Switzerland and to gain one more: I asked the Swiss Aero Club to officially enter a new category of World records at FAI Fédération Aéronautique Internationale called "Speed around the World East- and Westbound, both in the same year". The FAI record regulations stipulated some restrictions: There was a minimum distance to be covered and I couldn't fly too much North or South, but this wasn't a problem. The speed record around the World is calculated as the Great Circle distance between the departure and arrival airport (in my case Zurich / Switzerland) via the different control points, divided by the total time from Zurich to Zurich, which in my case was twice 27 days. This means the greater the distance covered in a given time, the better is the average speed. I wanted to cover all continents (with the exception of Antarctica), to cross all great Oceans and to pass the Tropics of Cancer (23.5° N) and Capricorn (23.5° S). I knew I also wanted to visit Sun'N Fun, as Oshkosh was absolutely out of the question, as I knew I would never get eight weeks of vacation involving the month of July and August. Then I had to think about weather. Where was the Inter Tropical Convergence Zone, how would the prevailing winds be on my longest over water legs, was the crossing of the North Atlantic in winter feasible? A lot of questions and a lot of work to find the right answers. Soon it was apparent fuel would be one of the big problems on the way. Especially in the South Pacific some of the islands didn't have AVGAS and early on I tried to organize two drums each to be brought to different places. But what do you do if you try by fax, letter, email and phone to reach somebody on Easter Island and you just don't get a reply? I tried probably dozens of times during a whole month with no result. I knew if there would be no fuel on Easter Island my eastbound circumnavigation would be impossible on the route I had planned. From Isla de Pasqua to Argentina I needed full tanks for a flight of about 16 hours. Finally the Swiss embassy in Santiago de Chile came to the rescue. It was ambassador Dr. Hans-Peter Erismann, a personal friend I know for several years that managed to attract the interest of the general of the Chilenian Air Force to the flight. He personally ordered the SAR group on Isla de Pasqua to sell me 500 liters of the precious gasoline. With this I knew the flight could go ahead. As I first planned to fly via the South of India to Singapore (they had fuel) I inquired locally about charges. The reply came at once. Handling in Bangalore would gladly be provided as it was mandatory, fuel would be available and the turnaround be completed in about an hour. This sounded all too good and I inquired again about the price for all of this. "Not much" was the reply and when I asked whether there was fuel in Colombo / Sri Lanka or in Male / Maldives, Arun Sharma told me there was with certainty none. Good businessman - and I still had no quote. He finally agreed to send me his pricelist. The Email arrived and the shock was deep: He listed different charges I would have to pay and the end result was more than US$ 1500 for one landing and it was unclear whether I would have to pay at least part of this for the subsequent take-off again. It was past midnight of the day of my departure, which was March 2, 2000 when I finished my last bit of preparation. I had made it - but just barely. The aircraft was packed and ready, the flight planning complete, all the over flight permits were here as well as the necessary visas and I was dead tired. Wake up was at five and when I wanted to depart Zurich at ten with a lot of TV and press around my airplane and my family, we were all freezing to dead and slowly but surely, my Long-Ez got covered with heavy wet snow. The visibility hovered around half a mile, the cloud base almost touched the control tower and I felt quite miserable. I was privileged as I was offered a seat in one of the few cars on the tarmac. I was at least out of the wetness and the cold and could warm up a bit. Shortly before eleven the cold air drop moved away to the East and suddenly the sun came out. The snow was quickly removed, I said goodbye to everybody and at eleven a.m. local time I was airborne. The big adventure had started. It was difficult to cross the Swiss Alps as a northerly current pushed the clouds towards the mountains and a crossing was only possible with intimate knowledge of the region. Soon I was over Northern Italy and out in the sun and four hours later I approached my destination of the day, Dubrovnik in Croatia. The airport reported heavy rain, thunderstorms and a crosswind of over 25 knots, which made me decid to divert to Bari in Southern Italy. But there I had to fight heavy rain just after landing which made me wet to the bones, then there was the problem of a friendly, but complicated bureaucracy and the fact there was no fuel because of a broken fuel pump. This meant I had to refuel the next day in Brindisi, before I could continue to Cyprus. Finally airborne in Brindisi I crossed the whole of Greece. East of the island of Rhodes there was a black wall in front of me, the cold front of the day before which made me so thoroughly wet and miserable in Southern Italy. I crossed it on instruments, as I didn't know exactly how high the mountains on some of the small islands were. Suddenly there was lightning in front, lightning in the back, heavy rain and the situation became quite uncomfortable indeed. Some 15 minutes later I dropped out of the edge of the frontal system and was in fair weather again. The landing at Paphos / Cyprus was uneventful. I was helped very nicely and without hassle I departed the next day for Abu Dhabi / United Arab Emirates. The front had moved on and I had to cross it again, this time over the mountains of Lebanon. There was icing and turbulence, some heavy rain but relatively soon I was on the other side over Syria. The communication was difficult because of their outdated Russian equipment. This changed to the opposite while crossing the border to Saudi Arabia. Their equipment as well as their personnel was first class and this was certainly true for the United Arab Emirates as well. No, not in Abu Dhabi. Everything worked very well; people were friendly and mostly efficient. Thanks to Swissair the handling was free and I had perfect help of district manager Schilter and his staff. Take-off was at midnight as I wanted to arrive in Colombo / Sri Lanka as early in the afternoon as possible. My goal on the whole flight was to be able to wait out a tropical thunderstorm which can last anywhere between 40 minutes and one and half hours and to be able to divert thereafter still during daylight to an alternate. I wanted to avoid by all means to tiredly fly into the night in the tropics and to arrive in darkness. The bureaucracy in Colombo was overwhelming. Many of the airport staff, but especially from immigration and customs was not only unfriendly, they seemed to do everything to make my live harder. I had professional help by a former Swissair employee who really knew where to go and what to do. Even with his very proficient help we needed three tiring hours until I could leave the airport. The next morning it was not much better. I have sworn to never make holidays in Sri Lanka, as they obviously didn't want me. The next day and some 15 flight hours later I landed at Singapore Seletar. What a difference! Help and friendliness everywhere - when I needed two minutes at customs or immigration, it was because of a short friendly chat with the nice officers. I completed my first 50 hours inspection the next day before I left for Darwin / Australia. Another long flight through tropical humidity. Over the island of Timor I lost my autopilot and had to continue by hand flying the aircraft. The arrival in Darwin was nice and not so nice, depending of whom I met. This time it was the lady of Australian customs who gave me a hard time. She talked as if freshly out of an American boot camp and I didn't feel welcome at all. What a difference to the real Australia I could witness thereafter. Everybody was friendly and helpful also we had no luck in repairing the autopilot the next day. My next stop was Cairns in Eastern Australia. TV was waiting and Terry Atkinson, the wife of a local Long-Ez builder, very nicely welcomed me to the East Coast. Shortly thereafter a gentleman with a nice, wide rimmed hat approached me. He inquired about my flight and my autopilot and said he was building an RV just next door with the same model of autopilot I had. Unfortunately he was deaf on his ears when I tried to tell him about my broken autopilot servo. He then walked away which meant the last chance to have my autopilot servo exchanged before Zurich was gone. I knew I had to fly for more than the distance of half around the world by hand - not a pleasant thought, but there was nothing I could do. A replacement from the US could have been there in days but to get it speedily out of customs would have been very difficult indeed. I was lucky to have enough fuel to fly some seven hours more to the island of Rarotonga, a small volcanic paradise in the middle of nowhere. It finally took another four hours to reach Tahiti, where I had to do an IFR approach by hand at night in moderate turbulence, something I had wanted to avoid by all means. The stay at Tahiti was very pleasant thanks to the UTA Aero Club of Tahiti, which really helped me in every respect. The stay was only too short, the next inspection of the aircraft had been done and many new friends encountered when I had to leave for my next stop on a remote island: Totegegie. Air Tahiti first had me pay for various charges several hundred US Dollars and flying by day and far from Tahiti, I had problems with the range of my HF radio. Thereafter the responsible manager of air traffic control wanted to ground me at this remote atoll some 1500 km from the next repair shop if I couldn't prove my equipment worked. Luckily I could prove it to the controller at Totegegie that finally let me depart for the long night flight to the Easter Island. This man in Tahiti really wanted to ground me on the Atoll. On the small airfield there was no telephone, no maintenance, no accommodation - no nothing. I could have joined the two employees who refuelled my aircraft to find some sort of accommodation in the small village on the other side of the lagoon but there would have been absolutely no chance for a repair whatsoever. On Isla de Pasqua I was very friendly greeted by a welcoming committee of local dignitaries and the Chilenian Air Force. The local commander helped me in any way possible for which I was very grateful. I departed the next day in late afternoon for San Carlos de Bariloche in Argentina, a flight of sixteen hours. It was concluded by an instrument approach to the lowest minima, something which was very difficult at my state of tiredness after the long night flight without autopilot. In time I learned of course to be patient, something I would dearly need especially in Brazil. But back to the positive sides of my trip: I had a very good time travelling for a day in Patagonia, meeting very nice people and seeing something of the region. This will certainly be reason to come back to this beautiful place in Southern Argentina. I continued along the Andes to Mendoza and then to Foz do Iguaçu, the famous Iguaçu Falls. I like Brazil very much, but in Foz my nerves were again thoroughly tested, until two hours after landing the local authorities released me. Beautiful Rio de Janeiro was the next stop before I landed at Recife on the North-eastern edge of South America. Who said Africa is complicated? I departed Recife in darkness to arrive at sunrise at the Inter Tropical Convergence Zone, a line with huge thunderstorms who slowly drift from West Africa over the South Atlantic to the Caribbean. I was lucky as I could pass through a gap where I had no real problems. The landing as everything else in Dakar was uneventful. Fuel was there in a minute, customs and immigration were passed without hassle whatsoever and the only problem was the many Muezzins, the Moslem preachers who blared their prayers one louder than the other from the many Minarets around hotel and town. This made sleeping a bit more difficult as well as the prayers in the morning that of course had priority over e verything else. All in all Dakar was a place with a low fuel price, low landing fees, no hassle, fairly competent ATC controllers and friendly staff. Who said Africa was less efficient and more expensive than South America??? My next stop was in Marrakech / Morocco before I arrived after 27 days practically on schedule in Zurich, where my family and a few friends were waiting for me. The first of my two circumnavigations was completed without major problems with the exception of the autopilot. Two friends of mine did a very thorough inspection of the aircraft while I was preparing for the next flight around the world, only five days later. It was a hectic time in which I still had to calculate flight plans, sort my maps and charts, organize a lot of different small things, answer the most pressing mail and receiving dozens upon dozens of phone calls and emails from all over the world to congratulate to the first circumnavigation. Saturday, April 1st was a very special day: I was invited to the yearly conference of the Swiss Aero Club where I was awarded four world records which I had achieved on my flight to an around South America in 1998. Much too soon my time at home was over and I had to depart again. Practically on schedule I left Zurich this time to the West. I crossed France in very different weather that ranged from splendid sunshine to very low clouds and heavy rain. I then followed the Spanish North coast in extremely bad weather in low visibility, heavy rain, turbulence and low clouds to Santiago de Compostela. Michel Gordillo, the famous Spanish pilot whom flew with a Kitfox to Oshkosh waited with some friends for me. They had a very nice welcome prepared that I certainly won't forget easily. My next stop was Santa Maria on the Azores. Departing Santiago was no easy task as the clouds were still almost on the deck. I followed the highway to the coast and soon flying was fun again. There was a light drizzle over my destination but otherwise I had no problems whatsoever. I was very friendly greeted by the locals, fuel was there in a minute and the airport authority was very nice indeed. When I was at the airport at three in the morning the general situation had changed a bit. This time the weatherman was less than helpful and when I was finally out on the tarmac I felt somewhat lonely indeed. There was no other aircraft, no car, no animal, no nothing with the exception of a fierce crosswind and heavy showers every five minutes or so. I managed to prepare the aircraft and myself but not before I was completely wet and quite miserable. When I was ready to close my canopy to depart to a very distant St. John's in Newfoundland, the canopy fogged up immediately, which didn't make my task any easier. It was a long and demanding day but I was helped in a friendly way in Canada and I was glad to be relatively early in bed. One more ten hours flight sometimes in splendid sunshine, later passing snow showers, gliding over beautiful scenery and battling heavy turbulence during the last hour of the flight, I finally landed at Teterboro airport in New Jersey, the skyline of Manhattan just a few miles away. But the day hadn't ended there. I made a flight for Swiss television three hours later that led around the Statue of Liberty and along the impressive skyline of Manhattan. As the TV-helicopter flew extremely slowly it was a very demanding flight, but the result was very gratifying indeed. The next day brought me to Jacksonville / Florida where Unison Industries, one of my main sponsors, had a very warm welcome prepared. Spruce Creek was the next stop. Friends of mine together with the Florida Wing of the Confederate Air Force had a very special welcome prepared that I highly appreciated. The next morning I was to have the honour to lead 15 historic T-34 of the Confederate Air Force to Lakeland. On schedule we landed at the opening day of Sun'N Fun and I was led to park my aircraft in front of the speaker podium - a very special honour that I highly appreciated. I then had a very busy time signing autographs, talking to the media, being for a short moment the star of the Discovery Channel and answering a multitude of questions. The time passed all too quickly and I had to depart again to fly via Galveston / Texas to El Paso / New Mexico where I landed on a small, but very well tended airfield in Santa Teresa. A Swiss pilot who had relocated to the US some years ago had invited me. He has a number of historic aircraft that he also rents to interested pilots and he treated me excellently. From Doña Ana airport I then flew to San Francisco before I left for the longest flight of the double circumnavigation. It took a long 16 hours and 31 minutes until I landed at Maui / Hawaii in a stiff crosswind. Again I had a very nice welcome by local builders and I spent two days on this small, but beautiful island. Almost as usual I departed at night for the next long flight to the Marshall Islands. This was no problem as I encountered even a slight tailwind and had to fight the first thunderstorms only during the last hour of the flight. The next step took me to Brisbane / Australia crossing an active front just before reaching the Australian coast. I had passed the North Pacific and part of the South Pacific and I was more than glad this had been done without a major problem. Problem - no problem? Not exactly true. Arriving in Brisbane and having given the order to my handling agent in Germany to send notice to Australian customs that I was coming and confirming this on my flight plan (ADCUST in box 18) which I filed the evening before, I was greeted by customs officials which in the beginning were quite friendly but obviously hadn't been aware of my arrival. After ten minutes I thought to have answered all questions and to have filled in the necessary forms. Then a lady from the same service arrived, which probably had been in the same class as the one I met in Darwin. Beauty was made up by harsh language and when I arrived in the distant terminal where she had ordered me to go, I was ordered by an officer to get a customs clearance for each and every flight in Australia. I filled out forms again, the atmosphere was frosty, and when I told them according to international ICAO regulations I was free to fly in all countries once customs inspection was complete, I was told in no uncertain terms, that international regulations were of no concern for them. The only thing that counted was customs regulations and it was made certain they wouldn't allow me to fly with a foreign aircraft in Australia without a special clearance for each leg. They let me finally go but warned me not to depart without their customs papers on board which of course they were unable to provide on the spot. It is amazing how many man-hours Australian customs in Brisbane spent for me. And it was for absolutely nothing. They asked for papers to be filled in, which probably nobody ever read and it seemed they had a good time to give somebody a hard time. Strange. As their boss I would have a very bad feeling as to competence, efficiency and customer orientation. I personally would fire one or the other on the spot for their behaviour and arrogance. Well - all this was compensated more than nicely by the many Australians I met on my way trough this wonderful country. With the above exception I truly only met great and extremely warm and nice people and I am very grateful for this. My itinerary first took me to the very South of Australia after having done one more inspection of my aircraft on the premises of Celsius Hawker Pacific Ltd. This company had helped me in Singapore and Darwin already and here in Brisbane I was glad about the knowledgeable and friendly staff. My next stop was Mangalore, a small Fly In of the Australian EAA. I was greeted as if I was an old acquaintance and immediately the officials went to work for me. I needed a customs clearance to proceed instead of Perth to Port Hedland in the northwest of the country, something that proved to be a major undertaking. It was Easter weekend. The availability of fuel had to be assured as well as the opening of the airport and customs for departure. It took almost two hours and many calls all around the country until it was finally done. Customs had agreed to the change in flight plan, the lady of customs in Port Hedland was aware of me and the fueller had promised to sell me the precious gasoline to reach Singapore. Night stop was 15 minutes away in Bendigo, a very nice small airfield some 50 miles to the West of Mangalore. In hindsight I probably committed a small crime to just follow an invitation and to fly to Bendigo without customs clearance. But as I was not aware of the crime at the time I did commit it, I hope the Australian government will forgive me for once - I am sure the Australian people will! The next leg took me to Forrest, a small airfield in the middle of the semi desert of the Nullarbor Plain between Melbourne and Perth. It was a very special landing at an airfield with just a hangar, three houses and a railway line close by. The Williamsons were typical Australians - friendly, helpful, reliable and uncomplicated. It was a pleasure to overnight at this remote place. The next day brought me to the coast and to Port Hedland. At the medium sized airport all hangars were wide open, but I met absolutely nobody with the exception of the friendly fueller who topped off my tanks after I had reached him with my handy. At four the next morning the lady from Australian customs waited for me at the hotel, escorted by her husband. I had offered to have me cleared the previous evening but obviously regulations are one thing, common sense something entirely different. Of course I paid for overtime but as the airport was completely empty this was a real farce as I could have left the airport whenever I pleased without anybody noticing. The long flight to Singapore was a constant battle with tropic humidity. There were scores of huge thunderstorms, small squall lines, and cumulus building everywhere. I managed to find a path towards Jakarta and then Singapore where I landed in difficult circumstances, as there was a lot of smoke from the burning of woods in Sumatra, strong haze and the setting of the sun to the West. I could only see down in front of me in a steep angle and it was difficult even with GPS not to scratch one of the many restricted zones around Seletar. Upon arrival Jet Aviation Singapore together with Swissair had arranged for a lot of press and a very friendly welcoming committee. I felt immediately at home again, seeing many known faces and having no hassle whatsoever. I knew it would be demanding to fly back home in just four days. I flew at night over the Strait of Malacca to Medan in Sumatra and from there straight to the West to Male / Maldives. Again I had to battle headwinds and huge, sometimes very active thunderstorms. I descended trough cumuli and showers almost down to the sea before dropping out of the heavy clouds. In Male Dave Anderson of Maldivian Air Taxi provided fuel and was very helpful indeed. He also brought me personally by boat very early to the airport as I wanted to depart well before sunrise for my next leg to Djibouti / Africa. Just an hour after take-off I flew out of the tropical humidity and had a very relaxing flight before reaching the African Coast over Somalia. I hadn't got an over flight permission as there is no real authority in this country. I flew high enough so as to attract not too much attention and after an hour of some, but not too much worries, I was out over the Indian Ocean again, heading for the small state of Djibouti. In Switzerland it was very difficult to get a visa for which the French Consulate General was responsible. When I was there the immigration officer just laughed and said he would have given me a visa on the spot. Djibouti is very poor and probably only survives with the help of the French and their military bases. Nevertheless the officials at the airport had been uncomplicated and helpful also the fuel was rather expensive. The next day I had to pass over the middle of the Red Sea because of the ongoing war between Ethiopia and Eritrea. I then crossed Jeddah / Saudia Arabia before finally arriving in Luxor / Egypt. The last time I had been there in 1997 I was held as a suspected terrorist for hours and hours. They were looking for a German (I am Swiss) named Schmitt (my name is Schmid) with a different first name than I have and a birth date that was four years different from mine. Nevertheless this was at the time enough to keep me until eleven p.m. This time I was lucky. Of course they let pass tourist in twenty seconds but if somebody comes with his own plane this is suspect in it. But after an hour or so I was out of the airport and soon thereafter I reached my hotel with a beautiful direct view on the Nile River. It felt like vacation. He next morning I did my last night take-off with 35% overweight. I was glad when I had reached my cruising altitude over the endless Sahara desert. The flight took me in fair weather to the Mediterranean, then via the island of Crete to Greece and Southern Italy where the weather turned. I had to battle my way along the coast about halfway up the Italian boot, then I crossed the Adriatic Sea to Croatia, passed Slovenia and Austria in very difficult conditions to approach Switzerland as predicted shortly before six. Over the small airfield of Altenrhein I was met by three friends in Vary-Eze's that flew in formation over the city centre of Zurich to Zurich airport. I was met by a lot of press and TV, my family was real glad I had returned safely and I was proud to have done it - to have circumnavigated the world twice in less than two month with an experimental aircraft, with a budget that was probably about one percent of what Bertrand Piccard and his sponsor paid for the single circumnavigation by balloon and with a team consisting only of my immediate family and few good friends. Homologation of over 160 different records is in progress and final results should be out soon. For me this was a tremendous adventure with pictures nobody can ever take from me. I would like to thank all my sponsors, the many people who helped me in one way or the other as well as my family for all they have given me. Without them, the flight would have been impossible. Last but not least this flight proved once more the viability of today's experimental aircraft. After the very successful completion of his twice around the World flights, HG Schmid had another very ambitious project in mind: “The Polar Frontier”, to fly non-stop from Zurich to Oshkosh and then to fly twice around the World via both Poles, Northbound and Southbound. He started the construction of a new aircraft in July 2001. The Express 200 ER (extended range) is a highly modified composite four place kit aircraft with fixed gear and a 315 hp engine. The first flight took place successfully on June 12, 2007. Our deepest sympathies go to Sibyl and their two children. Speed around the World Eastbound, Zurich to Zurich / 28MAR00: 69.87 km/h (plus 40.5 km/h / plus 137.89 % against the former World record). Speed around the World Westbound, Zurich to Zurich / 29APR00: 69.99 km/h (plus 46.68 km/h / plus 200.25 % against the former World record). Speed around the World twice (MAR/APR 2000), Zurich to Zurich to Zurich / 29APR 2000: 63.15 km/h (plus 53.99 km/h / plus 589.41 %) was not homologated as FAI had decided not to establish this new category of World records. Besides there were more than 160 new speed records over recognized courses homologated.